Do you want to get an impression what Xi (extra intelligence and intensity) is all about, than you may find in this menu-element lots of information. 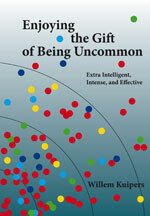 Its set-up follows the structure of the three Practices as described in Enjoying the Gift of Being Uncommon. All together it comprises about 30 pages of information. Of course the book itself is a more extensive source. I explain in three pages the relevance of Xi, my role in its development, and my vision on how to deal with the uncommon challenges that XIPs face: Why knowledge of Xi, Willem and Xi, and The three Practices. Then there are the three submenu’s of ACKNOWLEDGE XI, EXPLORE XI, and APPLY XI, of about ten pages each, that become visible when choosing one of those submenu’s. Although the pages have an implicit ordering, they usually do not have to be read in that sequence. Please choose the pages as you become interested in their subject. Right from the start of our Dutch website in 2002, we have always presented all kinds of information on Xi there. In the beginning that was practical and necessary, as few people were aware of the uncommon qualities of uncommonly intelligent people and of the relevance of personal acknowledgment of one’s own extra intelligence. Given the growing interest of English-speaking people, I started with an English (partial) copy of my Dutch website. The current website is the second version. It is my sincere wish that both ‘beginning’ and ‘advanced’ readers on the subject may find something to their taste. Please use the search function if needed. And of course there is much more information to obtain through my writings, or through coaching sessions with me. Enjoy reading!